You mean the hogs got beat again????? But I wore this cute headband my mom's friend Melisssa got me?!? How can we lose when I look this cute? Has Coach Petrino SEEN me? Good job Bama friends - Congratulations! Watch out Texas A&M - we are going to beat the Aggies next week! I watched the game and thought of you! I LOVE her new headband! Let me be the first to say ROLL TIDE!!! P.S. the headband is WAY cute!!! Oh man, you beat me to the punch!!! I will be the second to say....ROLL TIDE ROLL!!!!!! Harper's pix with the tp roll are so funny. She's getting cuter and cuter. Where did your friend get the headband? Mallory must have one! Harper looks precious and had she been on the sidelines cheering her hogs, they might have won! Cute pictures - I love the roll of toilet paper and the headband. She is sooooo cute. I can't believe how big she is getting. BEAUTIFUL!!!!! I'm here in Tuscaloosa and worked the game but I thought of you and Harper all afternoon! I'm a BAMA fan 100% but I think she's the most adorable HOGS fan I saw all day! Harper sure is sweet. And who needs toys when there is toilet paper to play with? A box of tissues is fun too. Oh she looks soooo cute.... I love the hairbow.... The pics are hilarious! Harper is just the cutest thing!! Hoping next week is a better week for the Hogs!! Harper looks adorable! I'm a BAMA fan, but I thought of you during the game. Cute post. :) Like I said, I'll be rooting for you guys in every game but this one. ROLL TIDE!! Roll Tide, Harper! You know, the colors in that headband closely resember Bama's. Maybe that's what caused the confusion.... Sorry you got "rolled!" Melissa is to sweet and thoughtful to all of her dear friends! Thanks for being there for Melissa! Harper always looks so cute!!!! My husband and I watched the game between Bama and Arkansas....he's so glad that we won....but he loved your recipe for the cake balls! Thanks! I love your blog and all the ideas you offer. Harper looks so adorable! I am so taking a pic of this post with the title Roll Tide and that precious pic of Harper. We were here in t-town and I thought of you and her about a million times in the game. Sweet little Harper would be right at home as a future Bama Cheerleader!! Did you really just title your post "Roll Tide?" HA!! They did roll today for sure. Love Harper's head band! Very cute! roll tide! sorry for your loss but happy for our win. thought of you during the game! At least during every OTHER game of the season! P.S. That headband is PRECIOUS! I need one for Greer...where did she get it? Do tell! Have a great Sunday and yes, Harper looks so cute in her new outfit!! I wish ya'll would have won - I really do!! Anyone that beats Bama is my friend! Harper looks precious as always! Harper is adorable but GIG EM Aggies! I hope next week brings a better outcome for your Hogs...I was pulling for you guys today. LOVE the headband! What great sportsmanship you have! Love your headband, Harper! I will be pulling for y'all against the Aggies next week! I love it- Harper with the ROLL of t.p.! Too cute. And, I must give you props for titling a post "Roll Tide"- you are a better sport than I. I'm sure you won't see a post titled "War Eagle" on my blog- EVER. LOL Love your blog! Roll Tide! What a cute bow/headband! It is available online? Can I send Harper a UK Wildcats outfit?? We desperately need some help, and I'm SURE the cuteness of her in a UK outfit would bring us some luck!! Sorry the Hogs lost, but I seriously doubt it was as depressing as ours. When Arkansas plays Florida, you might need to buy some mega rolls for all your tears! HAHA! The pics are absolutely precious, and I do love the headband. Have a great weekend! 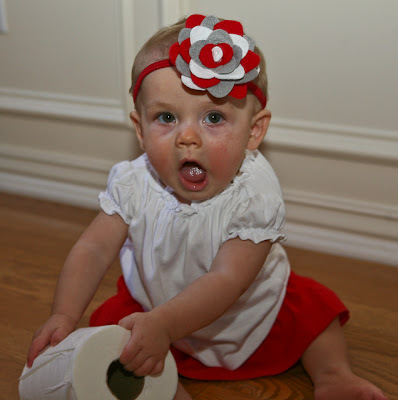 I'm a Big 10 fan, and couldn't help but think of OSU's Scarlet & Grey when I saw that headband! Harper really did look too darling for her fave team to lose! I found your blog through various blogging friends who follow you--great blog!! Looking forward to many more visits here--I am now following you. Definitely my favorite headband yet! Soooo cute! God love her heart with that ole' roll . . . . I'm an Auburn fan, so I was REALLY pulling for Arkansas. Bummer. Harper's headband is SO cute! Also, on your recent post about having a girl's lunch with Harper just brought tears to my eyes. I love my two boys and wouldn't trade them for anything, but thinking about the special bond between mom and daughter makes me really want to *consider* having another child. It was not a good afternoon in our household. Hubby's a bit perturbed with the Razorbacks. Of course, the crazy behavior during the game is genetic...my father-in-law has been known to leave the house during Razorback games because he just can't take it anymore. I'm sure our boys will be the third generation to be screaming at the T.V. when they get a bit older. Oh joy! I thought of you today during the game!! So sorry for the lost... we are Ole Miss fans, so this week was a bummer too!! I love her headband...she's getting so big!!! Man! I was all ready to come here and gloat, but you are being such a good sport about the Tide....I just can't do it now. I love reading your blog! It is so fun and you're so encouraging! I thought of you as I watched the game...Roll Tide! Cam's game was rained out though. So we sat home and watched football all day!! But we just got home from the Sonic Convention in Las Vegas last night, so we didn't mind! We've got so much Sonic swag! I need to send you a beach towel. They are adorable! Good luck next week!! RTR! Oh, and I could just pinch that little princess of yours. She is such a doll baby!!! Precious!!! Thought of you today, even watched the Razorbacks for a little bit, what else does an Aggie do when their game isn't on yet. Harper looks absolutly precious all dolled up in her Razorback outfit! Aww, she looks just precious! I was bummed about the Hogs too, but maybe we'll have better luck next time! Such a cutie. I thought of you during the game today. My "Alabama Crimson Tide" won but I also thought about how it would make you feel....so I kept you in my heart. Hope that helps a little. My oldest went to the game and tailgated before and after. He got drenched before, though. Sure hoping Bama can keep this good stuff up!! I won't gloat or call the game early... but the Aggies are going to give you a run for your money. May the best team win! Sorry for your loss :( I was hoping they would win b/c I hate BAMA! I am 100% Vol fan so anyone who beats BAMA is good in my books :) And I can relate to losing since I am a Vol fan. I'm a Big 12 kinda girl (and a Texan! ), but definitely not an Aggie fan, so I'll also be cheering for the Razorbacks next week! go hogs! What good sports, y'all are! Harper keeps getting cuter. Is it possible? I also thought of you during the game. Better luck next week! The headband is so cute! SO CUTE! And sorry bout the loss, but maybe next week the Hogs'll do better. LOVE her headband! So sorry about your loss- I know it hurts to lose to the Tide- I'm a Vol fan. Better luck next week! I was pulling for the Hogs today (since they weren't playing my Dawgs, HA!). Sorry about the lose. They'll get them Aggies next week. Those pictures with her and the toilet paper are to stinking cute!! I need to know go recover from the heart attack my GA Bulldogs gave me. All these close games are going to kill me. I absolutely LOVE the headband and my daughter NEEDS one! Do you know where your friend got it from? haha Kelly I thought of you all day today- but can't say I'm sad with the outcome!!! Harper is sooo freakin cute! hehe. .toilet paper? that must have been fun! If the Ags lose I can just fall back on my Arkansas heritage. We are going to be in Dallas next weekend. Maybe someone will give us free tickets! How cute is she! Who can deny a face like that!!! That little one of yours is too cute. She looks like such a ham. Mommy to 7. 9 and under. Love the headband Harper it is too cute. I am a big Auburn fan so I was pulling for the hogs and very disappointed when the tide won. But you have wonderful sportsmanship about the tide beating ya'll & I hope that I can also display that type of Christian behavior. We saw that the Tigers need to watch the videos so they can beat that tide! Go SEC & War Eagle! I love the headband!! Can you tell us where it came from? I am sorry they got beat. Our team, Ole Miss, got beat too! Maybe we will get a win next week! I love the headband and will be at the game next weekend. Gig'em Aggies! hahah, loved the pictures. you take a beating well, kelly! Sorry yall lost...but I hope you lose again next week! ha! Gig'em Ags! I am so excited we are playing yall next week. I live in Houston, but we are driving up to Arlington to see the game. We are huge Aggie fans and don't miss a game that is within reasonable driving distance! RTR! We were actually supposed to be at the game today, but had a change in plans...plus it has been raining like crazy and would have probably made for a nasty day!! Love Harper's little white top she has on in the se pictures! I hope not! Gig 'em aggies!!!! I'm sorry I have to do it....Roll Tide!! Don't worry I will be pulling for the Hogs the rest of the season. I always root for the Hogs (until today) and will continue to pull for them the rest of the season. But I gotta say it...ROLL TIDE BABY!!!! Gig' em Aggies!!!! I am going to the game next week at the new Dallas Cowboys stadium. I cant wait!!! Whoop! I was sooooo shocked to see your title! I thought of you all through the game, and how you were probably "calling the hogs" with all your might! Roll Tide! That headband is the cutest thing ever! I need one for myself! I admit, I did think about you when I was standing around in the rain yesterday at the game and wondered if you were making Harper laugh with all of your screaming! Roll Tide! Roll Tide! And good luck next week! Harper is so stinking cute in that headband!! Sorry your team lost! Hope you roll the aggies next week. As a UT Alum, I'm a fan of ANY team playing the Aggies!! Gig 'em!! My Ags are on a roll :) It will be a fun game!! Love the cute pics of Harper! Since I am a UW Badger fan, I'll root for your Hogs anytime. :) Sorry they lost yesterday. I was so impressed when you shared that you root for other SEC teams; we don't do that as well in the Big 10. I was also impressed when you said you dressed up for the games. I have my red WI t-shirt and jeans. Dressing up would be so much fun!! Love your little Hogs fan, though! TOO CUTE! You know, she is ADORABLE dressed in Bama colors!ROLL TIDE. I was thinking about you yesterday as I was in the stadium watching the game! Roll Tide! Very cute outfit by the way! we are big aggies and will be at the game on saturday. I can't wait to see what happens..
Next week will be a tough week in our house - the first time we've been forced to pick between our beloved Aggies and my familes Hogs. But still - GIG 'EM AGGIES!!! I just have to say..."GIG 'EM AGS!" When I saw the title of you post I was taken back! No gloating here. You have to act like you have been there before. As I was watching the game I was thinking of you and what you would have to say. :) And the Tide Nation knows how it feels during those rebuilding years. Glad we won this one. Good Luck to the Hogs next week. If we do not beat the Aggies, I have to do ALL the Thanksgiving dishes at our family feast (I'm talking 75 people). WHEN we win, my Aunt has to do them. After yesterday's outing, I might need you to add me to your prayer requests! GO HOGS! Watch out, Harper! The Aggies are on a roll! Our little Hogs need to get with it quick! :) I hope they win the next one. I think we will be at the Homecoming game on Oct. 10th. It will be nice to go to a game this year! I was hoping that they would win for ya! Maybe they'll win the game AFTER the Aggies (sorry, I'm a Texas girl now). It was a good day for our family yesterday because the LSU Tigers beat those MSU Bulldogs!! I am a die hard Bama Fan, so ROLL TIDE! But, Harper is still a cutie pie no matter what fan you are. Harper looks adorable, but she would look even cuter in maroon and white! Gig 'em Aggies! WHOOP! Fightin' Texas Aggie Class of 2002! She is so adorable it makes me feel bad we beat ya'll. :) Sorry we rolled right over you - there's always next year. I am sorry that y'all lost. I am an East Carolina Pirate fan and we "Painted Purple" this weekend. Even if you guys did not get a "W" Harper outfit gets a "W" for sure. I love the headband. do you mind asking melissa where she got the headband? - I'd love t ohave one in orange and white- Go Vols! Awwww...Harper IS cute in her headband! Love it! We've been looking forward to the game next weekend all season. Should be a good game! She makes a cute Roll Tide Baby!!! Love your good sportsmanship - it's all about the SEC huh? Hope the rest of your season is great! Kelly, I was at the game and thought of you! I'm a new reader to your blog from Bama! I've enjoyed reading your blog and you and your Harper are precious! Roll tide!! We went to the game and I thought about you while we were there. Good luck next week!! Harper is adorable! Love the headband! It would have been NICE if our defense would have shown up! *sigh* Oh well - we'll get those Aggies this week! :o) Maybe you should take Harper to see Coach Petrino so he can kick our Hogs into gear! She such a sweet little cutie patootie that she can cheer anyone on and they'll win just because she's representing in her cute little hog outfits! HA! Oh my word I MADE THAT HEADBAND! Dear sweet Melissa is one of my favorite repeat customers so when she asked me to custom make her a band with her teams colors I was of course thrilled to do it for her! So great to see precious little Harper in one of my creations! okay so I waited until Monday to leave this comment... Just so the sting of your lose wouldn't be so great! But I must say...ROOLLL TIDE! Okay now that we have that out of the way....Harper with the roll of toilet paper...SO cute! Thanks for that shout out! I'll be pulling for your Hogs this coming saturday! It's NO fun to have that many loses in a row. And as a lifelong BAMA fan, I have seen plenty of those kind of seasons! Okay...I'll say it... GO HOGS!!! Best of luck for the rest of the season!! Harper is too cute! I always love reading your blog for so MANY reasons but one is because I grew up in Arkansas (now live in TN)! While I lived in Arkansas for 19 years, my family stayed true to their roots and taught me to cheer for Alabama! Roll Tide! Good luck to the Hogs the rest of the season! Roll Tide! Even with our win I could cheer for some hogs if every fan was that adorable! This is the cutest pic! Love it. I've been thinking Harper would look so cute in maroon and white...she's so stinkin' cute in anything.